With South Walton Fashion Week upon us, we thought this would be a perfect opportunity to show off some of our most stylish listings. So take a tour through the clean lines, sparkling lights and creative character of 12 homes we love right here in South Walton and Destin. Privacy, exclusivity, space to breathe: This describes Sarayu, which means “Spirit Wind”. This contemporary home offers views of Eastern Lake, a rare coastal dune lake, and the Gulf of Mexico from the azure-blue, Gulf-front pool, which seem to fool the eye into believing you’re on a deserted island. There are few homes on this quiet stretch of sugary sand and even fewer people. The spectacular bay views are sure to impress, but take a look inside this incredible Low Country style custom home that continues the tradition of amazing architecture in Churchill Oaks. The open interior floor plan features the finest fixtures and finishes available, white oak floors throughout living and bedrooms, marble baths, and spectacular views from every room. 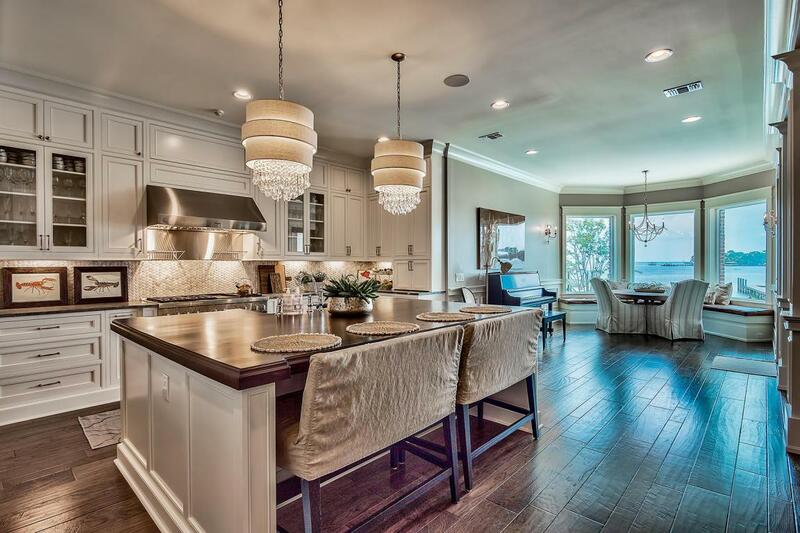 46 Bennet was rightfully the 2016 Parade of Homes winner. Settled in the new urban, coastal town of Alys Beach, is this breathtaking villa. Gorgeous natural Coral Stone Tile floors line the interior and exterior living spaces, Calcutta Gold Marble stretches across kitchen and bathroom counter-tops, high beamed ceilings and white Venetian Plaster walls contribute to the light, bright and open feel of the residence. This exclusive home invites you to stretch out and enjoy the expansive, luxury accommodations and styling. This extraordinary home is both elegant and highly functional with pristine Mediterranean design juxtaposed California contemporary outfitted with notable features such as a solid Cypress suspended floating staircase, floor to ceiling glass windows allowing optimal water views from every living space. Home of fashion designer Stephanie Carter is a funky masterpiece and perfectly styled to evoke creativity. Sconces dripping with crystal lead and cool, unique guitars are only the beginning. You have to see it to fully take in the incredible spaces. Discover one of Destin’s most exquisite custom built homes that has been decorated to perfection and recently featured in the Kitchen Culture article of September’s Art & Home magazine, a joint publication of Sotheby’s auction house and Sotheby’s International Realty. 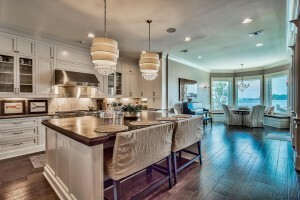 It’s easy to see why we chose this home as one of our most stylish. 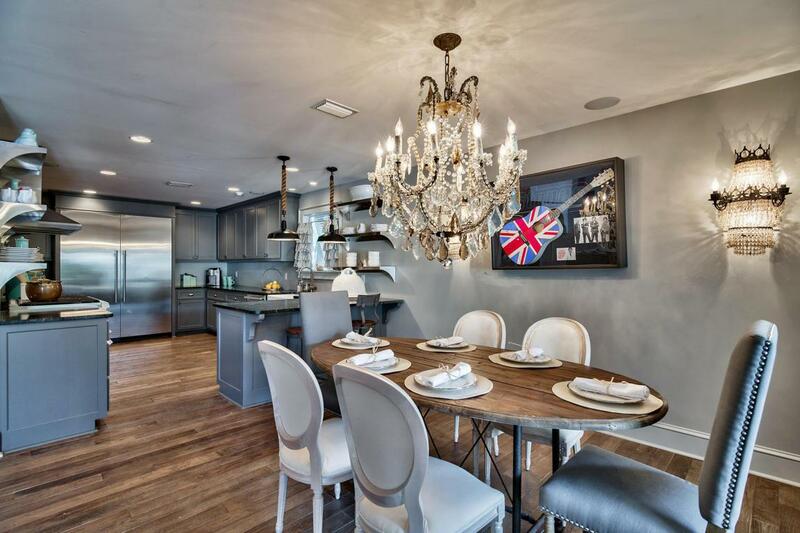 Designed with many one of a kind features, this home is planned around a gourmet kitchen featuring Calcutta Gold marble countertops and a butler’s pantry. The home is ideal for entertaining with a built-in wet bar featuring black limestone that complement the rich walnut counters. The large master suite on the fourth floor boasts a balcony and seating area with plenty of privacy. Here you are away from it all. You are surrounded by nature and gulf views and immersed in style. The first floor layout boasts dual bunk rooms, as well as two large bedrooms and adjoining baths as well as an industrial style game room complete with a custom boat bar & built in wet bar including a full size Sub-Zero fridge. This old Florida home allows open natural light throughout the rooms, a 19 ft cathedral ceiling, 10 ft windows, state of the art appliances, a hint of old world romance and beautiful indoor/outdoor living spaces. This is the epitome of Seagrove Beach living. 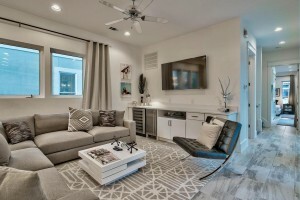 The stylish interior design is defined by professional modern decor, clean lines & artistic accents creating a fun, vibrant atmosphere that characterizes the functional open floorplan. 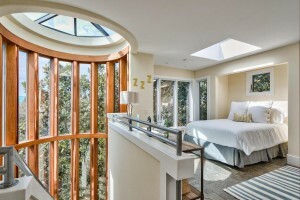 The second story main floor master suite includes a 17 foot cypress and copper glass round wall that defines this luxurious space and allows you to enjoy the incredible tree top views in complete privacy. Just steps away is your own peaceful yoga and meditation retreat. This is what peace and tranquility looks like.